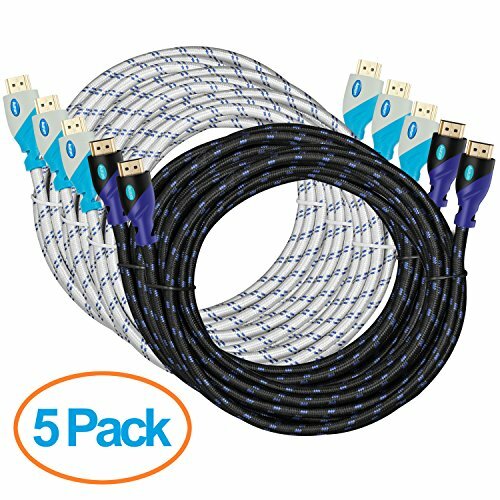 HDMI combines both audio and video into one convenient cable, so it's all you need to connect your HDTV to your A/V receiver, Blu-Ray / DVD player, Microsoft XBOX ONE, Microsoft XBOX 360, Sony PlayStation 4, Sony PlayStation 3, Nintendo Wii U, High Definition (HD) Cable Box, Personal Computer, Laptop, Netbook or any other (High Definition Multimedia Interface) device with an HDMI output. - HDMI connectors are 24K Gold plated. We at Aurum Cables put tremendous effort in excellence of quality in the cables, we will back our HDMI Cables with a Limited 1-Year Warranty. QUALITY CONSTRUCTION: 28 AWG Pure Copper Conductors, Triple Shielding and Gold-Plated Full Metal Jacket Connectors provides strength, durability and prevents interference or signal degradation. WARRANTY: All Aurum Cables HDMI cables are backed by a Limited Lifetime warranty. Please contact us via email if you have any questions or concerns. If you have any questions about this product by Aurum Cables, contact us by completing and submitting the form below. If you are looking for a specif part number, please include it with your message.